How difficult is it to find your way from Andheri to Thane? Ask those who participated in the Gulf Foster A Child Rally on Sunday. They will tell you that it is not as simple as it may sound, particularly when driving through a maze of directions. Indeed, Sponsored by Gulf Oil Corporation Ltd., in association with In Mumbai, the second Gulf Foster A Child Car Rally, organized by Sportscraft, was an exercise in concentration and precision reading of the course, from Shehasadan in Andheri to the Golden Swan Country Club in Yeoor Hills in Thane. And coming out best was Sanjay Thakkar and his crew of Mheerman Kelkar and Saranjeet Singh Virdi. The trio deciphered the specially prepared tulip chart astutely to finish with the minimum penalty-points (10 minutes) and emerge triumphant. The trio of Zaheer Mirza, Iffat Mirza and Tushar Patel (16 minutes) finished second while the team of Nisha Sutaria, Paru Archrekar and Jay Thakkar was third. There were six all-ladies teams. The best among them was Deepa Damodharan's. She along with Anila Likhite, Premila Damodaran and Vinaya Lanewalla did well to finish with a 35 minutes penalty. 26 vehicles, with underprivileged children from the Snehasadan orphanage as co-crew members, were flagged off from Andheri by Mr.K.P.Raghuvanshi - I.P.S - Special IGP / Joint Commissioner Of Police Anti Terrorist Squad Mumbai, Maharashtra, at 8:30 am. Thereafter it was survival of the shrewdest as the participants drove through the narrow lanes and streets of Mumbai. For starters, the rally was not about speed but skill in finding the way by use of a tulip chart. There were many time controls along the course where the participants had to check in. The vehicles were flagged out at a minute's intervals and late or too early checking in incurred penalty points. As they drove from Andheri, it was back and forth via Five Gardens, Matunga, Bandra, Dharavi, Chembur till the finish at Thane. Many of the drivers lost their way. Some followed the vehicle in front of them and paid the price, while many dashed off to the next time control, not realizing they would be checking too early, and lost vital points in the process. But while the drivers pulled their hair to find their way out, the children accompanying them were ecstatic, not bothered about the plight of the one at the wheel and co-driver. They were just happy to explore Mumbai. Some of them confessed that it was the first time that they saw places. Some of the children had the good fortune of being literally taken for a ride. One of the participants, Sarla Sharma, despite trying her best, got lost after taking a wrong turn at Santacruz. And what did she do? She took the kids who were with her shopping, brought them some toys and video games and them took them home for a treat before returning to the Golden Swam Country Club. In fact, there were many like her who participated in the rally for the fun of it; to do their bit for the underprivileged children. Deepa Damodaran, who was the best among the ladies teams, said, "It was a really enjoyable experience. The tulip was not very easy but we did well to follow it. But more than participating to win we joined the rally because it was for a cause. 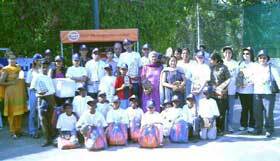 We were happy to do our bit for the poor children of Snehasadan." Also commending the rally was Dr Dinawaz Gamadia and his crew of Zarin Havewalla, Dr Anavaz Havewala and HIra Havewalla, who were adjudged the team with the best decorated car. Their T-shirts had a message: India shinning with such roads? Good or bad roads, for them and like most of the participants it was a "great event'. And looking at the way the kids from Snehasadan enjoyed their day in the sun, surely, Gulf Oil Corporation Ltd., will be back next year to sponsor the event for the third straight year.